Patch Management – combat security vulnerabilities automatically. Gone are the days of manually searching for patches. With the rise in security breaches and increased pace of software updates, patch management is no longer a “nice to have.” And, with hundreds of patches made available each month, patching third-party software is a tedious and manual process, requiring significant time and resources from you and your team. Jamf Pro reimagines this process, giving you an automated way to combat security vulnerabilities. Ensure users always get the latest and greatest software, so you can avoid known security issues and put your security team at ease. Take the guesswork out of patching your devices. Jamf Pro 10 gives you automatic visibility into which devices are eligible for each patch and automated patch scoping to bring your devices into compliance. You define user interactions and set deadlines to update or communicate additional details. Start your day with to-dos already crossed off your list. Jamf Pro is the only solution with automated patch alerts for third-party apps built right into the platform. Patches come to you, so you can re-deploy the resources you use to look up patches to do more strategic work. 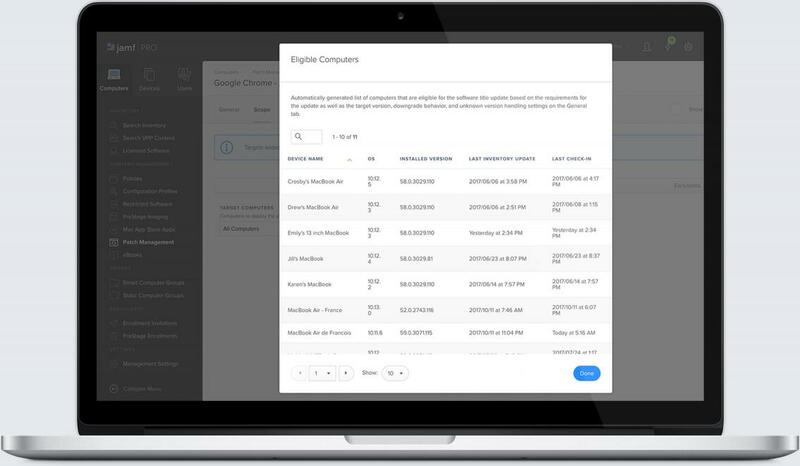 With automated patch management software notifications, you’ll always know when third-party software patches are available so you can take action. Firefox patches? Adobe Creative Cloud patches? Microsoft Office patches? We’ve got you covered. Not all patches are created equal. Deploy off-the-shelf patches with ease. Or, build custom software packages with a simple point-and-click interface in the format of your choice. Sign packages for frictionless deployment without security warnings. Avoid compatibility issues by ensuring software version consistency throughout your organization. Distribute patches to an individual or group. Make software patches available to users on demand or push them directly to devices. With complete visibility into the status of your patches, report on all of the software titles and versions installed in your environment. See which computers are on the latest version and which aren’t, giving you the ability to demonstrate compliance or take action. What about App Store apps? Use Jamf to automatically update Mac, iPad and iPhone apps from the App Store, or deploy individual updates as needed. Patch Management from Jamf is a game changer for many of us. It handles 90 percent plus of the now manual patching we need to do. Pure brilliance. Mike Morales Senior Mac Systems Engineer, Worldcom Exchange Inc.
See how you can keep Macs, iPhones and iPads protected across your entire organization. Eliminate the manual process of patching and let software updates come to you. Ensure device security and continuity with Jamf Patch Management. Don’t just take our word for it. Take Jamf Pro for a free test drive and tell us what you think.